Hammer drills are becoming more and more powerful and can handle many of our concrete drilling needs, but when we need to drill larger holes or we need speed, a rotary hammer is the way to go. 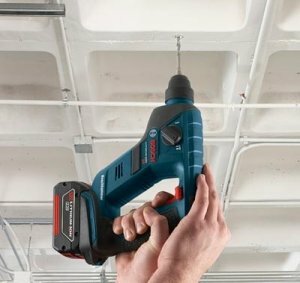 Bosch's new RHS181 18-volt cordless rotary offers the portability we want from hammer drills, with the power we expect from rotary hammers. The design of the new RHS181 is pretty cool looking. In an effort to make the tool even smaller than other cordless rotary hammers, Bosch took some of the inner workers of the tool and relocated them to be almost perpendicular. The RHS181 is a 1/2-inch rotary hammer, meaning that it is rated to drill holes up to 1/2-inch in diameter, and it comes with the popular SDS-Plus chuck. Other features of the drill include: Electric Cell Protection, an LED work light, and a drive selector that can turn off the hammer action. Being able to turn off the hammer action is especially important when drill certain types of tile. The look of the RHS181 is very similar to that of the Bosch RHH180 3/4-inch Rotary Hammer, but it relocates the battery pack and it is 1.1lbs lighter. Look for the RHS181 in stores soon as a kit (RHS181K) which includes a single 3.0Ah HC battery and I assume a charger and case, for $285. The bare tool RHS181B will also be available.